“Silent Night! Holy Night!” This Christmas carol, which is probably the best known in the world, originated from three tiny municipalities in the province of Salzburg. 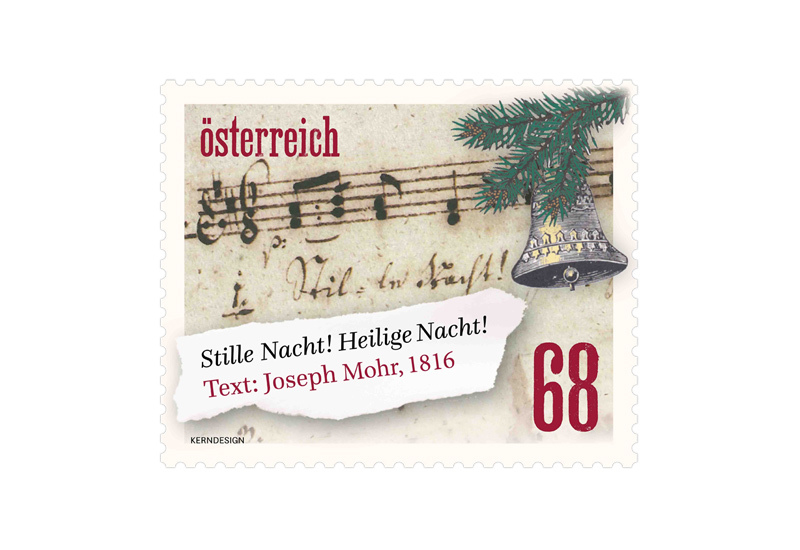 It was at Christmas in 1818 that the assistant priest Joseph Mohr came to the teacher Franz Xaver Gruber and asked him to compose a melody for his poem of the same name. However, Mohr did not write this in 1818, as was long believed to be the case, but, rather, had written it in 1816, which is why the lyrics of this well-known carol at least are celebrating a special anniversary in 2016. In 1816 Joseph Mohr was an assistant priest in Mariapfarr in the Lungau region, the municipality where the “holy child with the curly hair” is to be seen on an altar painting in the church, which was probably Mohr’s inspiration for the famous line from the poem. Franz Xaver Gruber, in turn, was working as a teacher in Arnsdorf in 1818, and it was in the schoolhouse there that he created his composition. In his “Authentischen Veranlassung” (true reason) which is preserved to this day, Gruber himself described how Mohr approached him on 24th December 1818 and asked him to compose a song for two solo voices, choir and guitar. Gruber set to work that very evening, and then played the song to Mohr, who himself was very musical. The two decided to give the inaugural performance that very same night. Some anecdotes tell that the positive, that is, a smaller version of the organ, in the parish church of St Nikola von Oberndorf was not working. This is supposed to be the reason why a song with a guitar accompaniment was needed so urgently and was composed by Gruber. Whether this really was the case or whether it is just one of the many romantic stories that one hears in connection with the song’s composition – well, who knows? When the now so famous Christmas carol was first performed on that Christmas Eve, it was Mohr and Gruber themselves who sang the solo parts. It is reported that the inaugural performance met with “general acclaim” from the people of Oberndorf. Following the reorganisation of the Congress of Vienna and the drawing of new borders along the Salzach, they were battling with uncertain times, which accorded well with the less well-known verses of the song. The song originally had six verses, although we now generally only sing three of these: the first, the second and what was originally the sixth verse. The Christmas carol subsequently became known worldwide, has been translated into many different languages and is now included in UNESCO’S intangible cultural heritage. On this special anniversary of the poem “Silent Night! 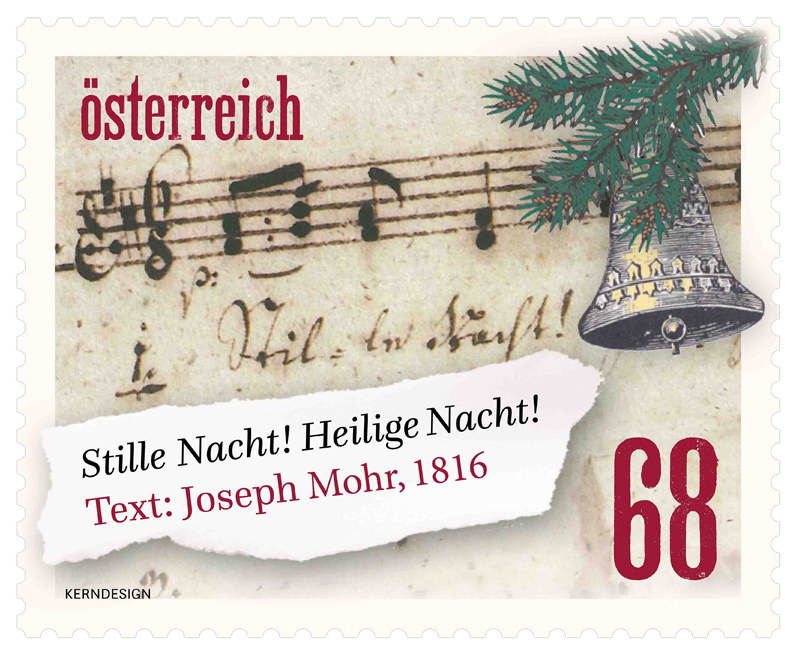 Holy Night!” a commemorative stamp is being issued showing an excerpt from a manuscript housed in the Salzburg Museum. Whilst this is not the original version of 1818, it is the only surviving copy of Silent Night written by Joseph Mohr. This handwritten copy including the text and melody is dated to 1824 and bears the simple title “Christmas Carol”.